The Akiles Diamond 1 Round Cornering Machine is one of the strongest and most efficient manual round cornering machines in its class. 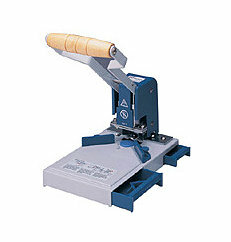 If you are looking for a professional and consistent result this corner machine is for you! The Diamond 1 comes standard with the 1/4” die but the 1/8”, 3/8”, Half Moon Die and the 45 degree die (straight line) can be purchased separately. The Akiles Diamond 1 corner rounding machine is one of the most cost effective and versatile pieces of corner rounding equipment available on the market. The Diamond 1 will cut through materials including: PVC, polyester, leather, paper, polypropylene, and more material up to 0.4” thick. The Diamond 1 increases productivity as it is specially designed to cut through multiple sheets of a variety of materials at a time with little effort and with minimum die reduction. This rounding is ideal for rounding covers, pouches, pictures, all types of ID’s, invitations, postcards, etc. There are several benefits with using the Diamond 1 Round Cornering Machine. The high quality manufacturing machine is small enough for almost any table or desk, it is light weight and easily portable. Since there are a variety of dies available this machine is very versatile for all your round cornering needs. However, the Diamond 1 has a smaller capacity of .4”, whereas most other low to mid-volume corner rounder’s have a cutting capacity of 05”. This machine comes standard with an “L” guide, plastic pads, and a radius alignment guide which allows you to get the perfect cut every time. Also, cleanup is very easy with the wastebasket that is included, all you have to do is empty it when it gets full! If you have any questions or are interested in purchasing the Diamond 1 Corner Rounder, visit us at SpiralBinding.com. We have great pricing on a full line of Round Cornering Machines. Call us at 1-800-631-3572 for more information.